Hedonistic party, Pushca rears its head once more on Saturday July 14th when its flamboyant production transforms London’s latest new club location, the Hub @ the London Pleasure Gardens. Famed for its free spirited atmosphere and dressing up ethos, this larger-than-life event is back with a bang as it raises the roof with headline DJs David Morales and Scarlett Etienne. Organisers are promising the biggest stage production in Pushca’s history with some of the hottest dancers and performers from across Europe flying in for the event, coupled with pyrotechnics, cutting-edge technology and special effects. 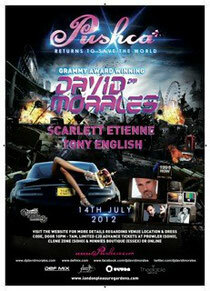 Grammy Award winning superstar DJ, David Morales will be playing his first London date of 2012 exclusively for Pushca, alongside Scarlett Etienne. Scarlett will be dressed by fashion heavyweight, Matthew Williamson, and has graced the pages of Vogue as well as compiling soundtracks for runway shows at London Fashion Week. She has played at club nights as diverse as New Yorks’ Sound Factory, Alter Ego and II Muretto in Italy, Crosstown Rebels Party and Out of Order in London and Tribal Sessions in Manchester. Joined by Pushca resident DJ, Tony English, the party soundtrack will potentially be the most extrovert Pushca yet. After a two-year hiatus, Pushca hopes to stake its claim as one of the capital’s premier events, embracing all things cosmopolitan, and where the glitterati, fashionistas, fun lovers and curious can rub shoulders with each over and be dazzled in an over-the-top, flamboyant feast for the senses. Numbering fans such as Kylie Minogue, fashion designer, Julien MacDonald, Boy George, and former hellraiser, Robbie Williams, Pushca plans to let its hair down and party in inclusive style.